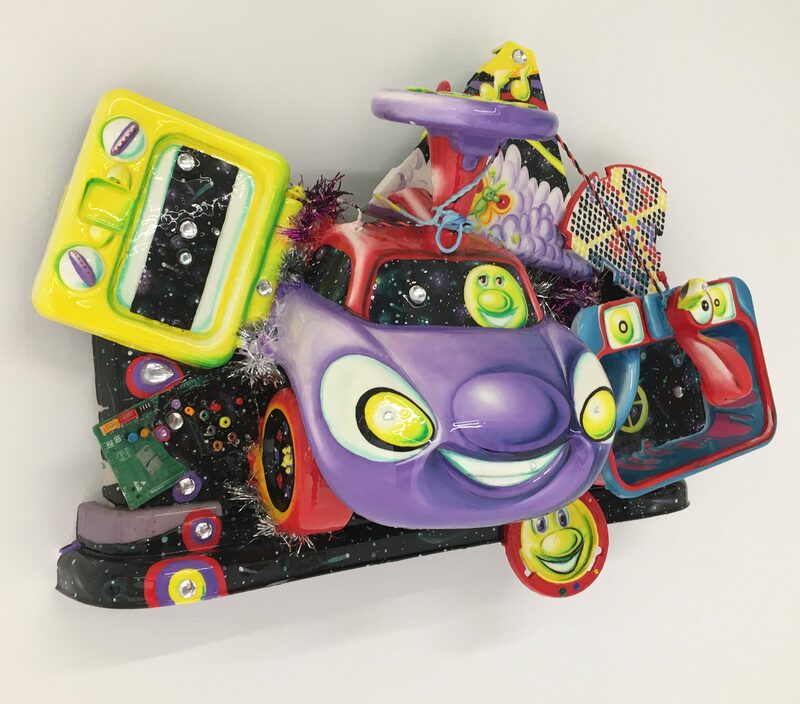 Whether you’re seeing his colorful works out on the street, or in the gallery, Kenny Scharf has one of the most instantly recognizable styles in the contemporary art world. 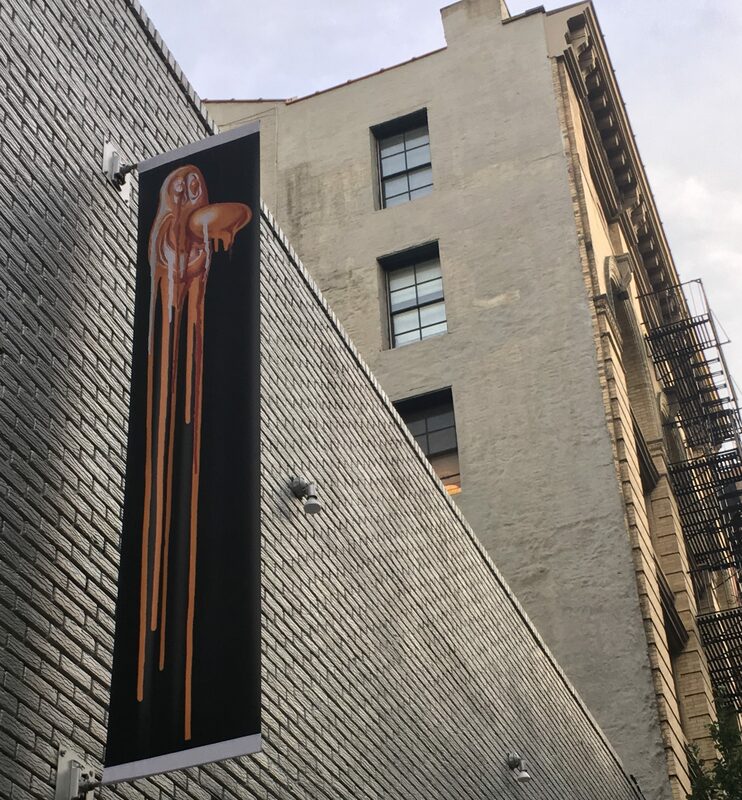 Deitch Projects downtown is currently hosting Inner and Outer Space, an ambitious exhibit of Sharf’s newest works which features several distinct collections that provide evidence of Scharf’s enthusiasm for expanding his oeuvre, while staying true to the playful characteristics of his work that his fans love the most. 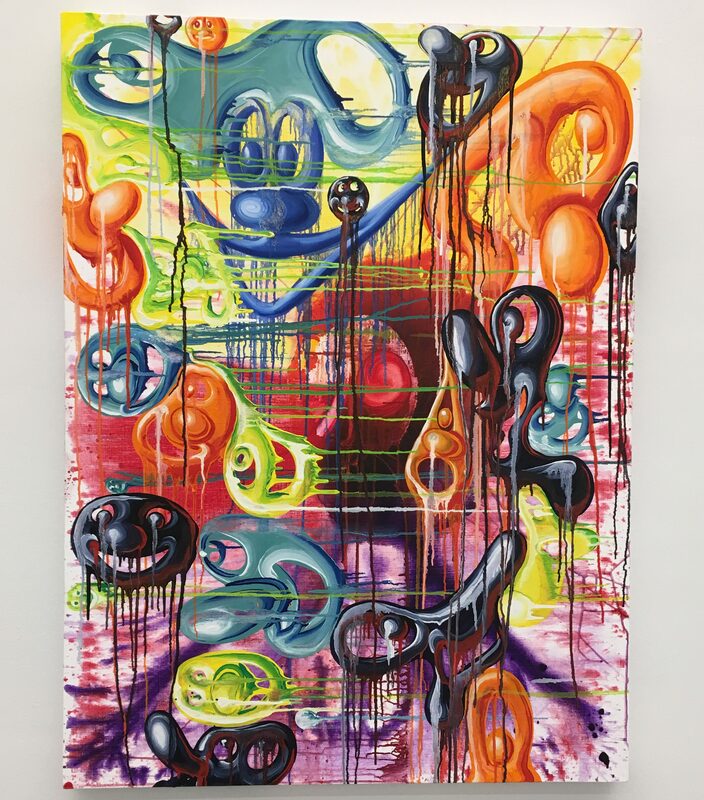 The faces are melting in Kenny Scharf’s new paintings. 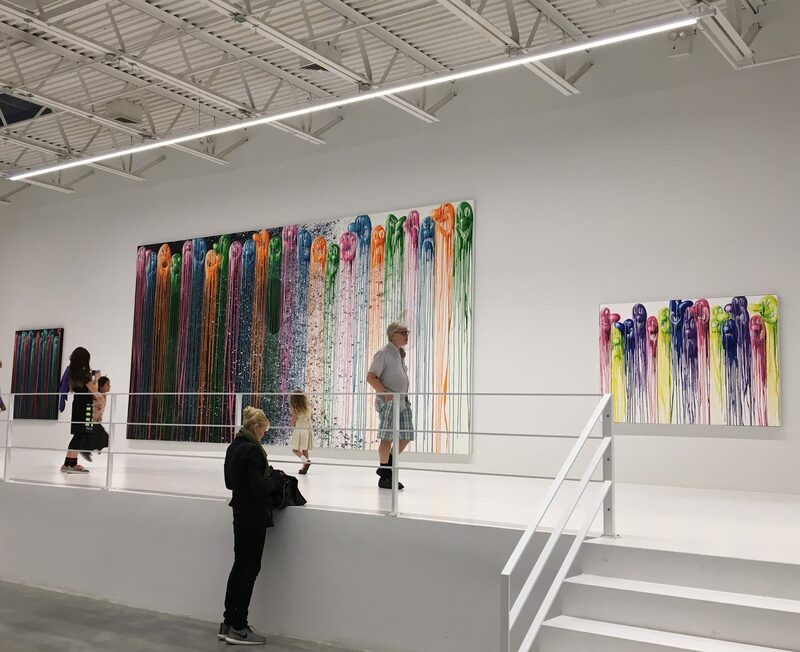 “Things are disintegrating,” says the artist. 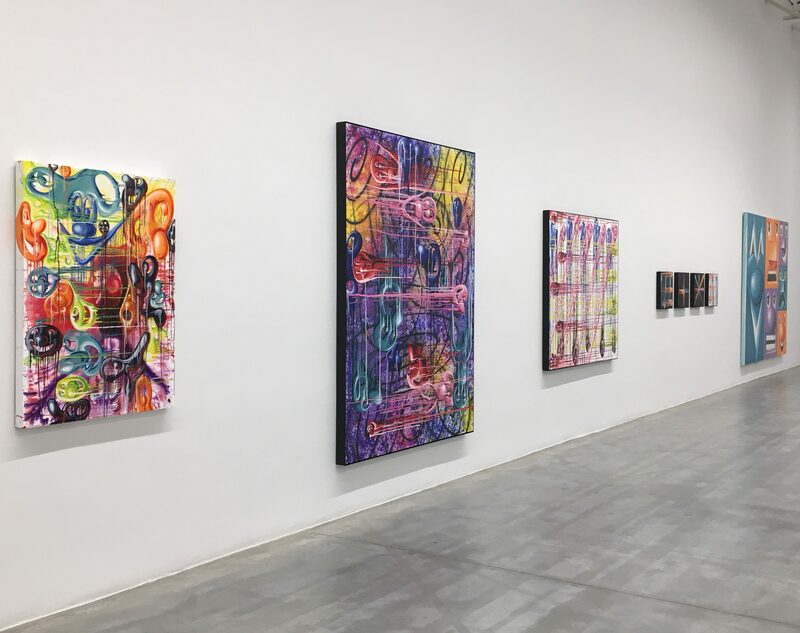 “I am reacting to our increasingly out-of-control situation.” Scharf’s work continues to be infused by his inexhaustible optimism and his sense of fun, but there has always been an engagement with profound issues beneath the façade. Ecology, the environment, and capitalist excess have long been central themes. 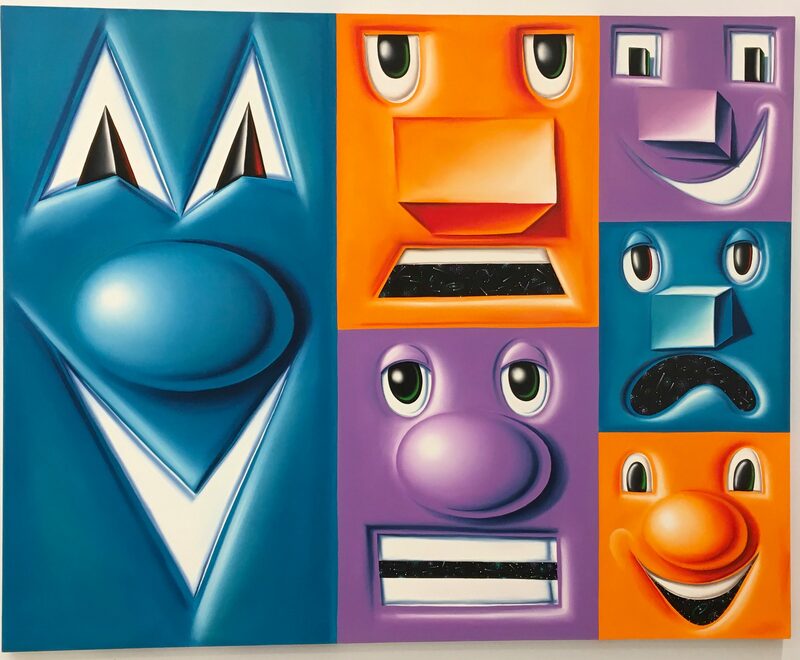 Like his artistic colleagues from his early years in New York, Jean-Michel Basquiat and Keith Haring, Scharf studied cartoons as a way to intensify figurative expression. 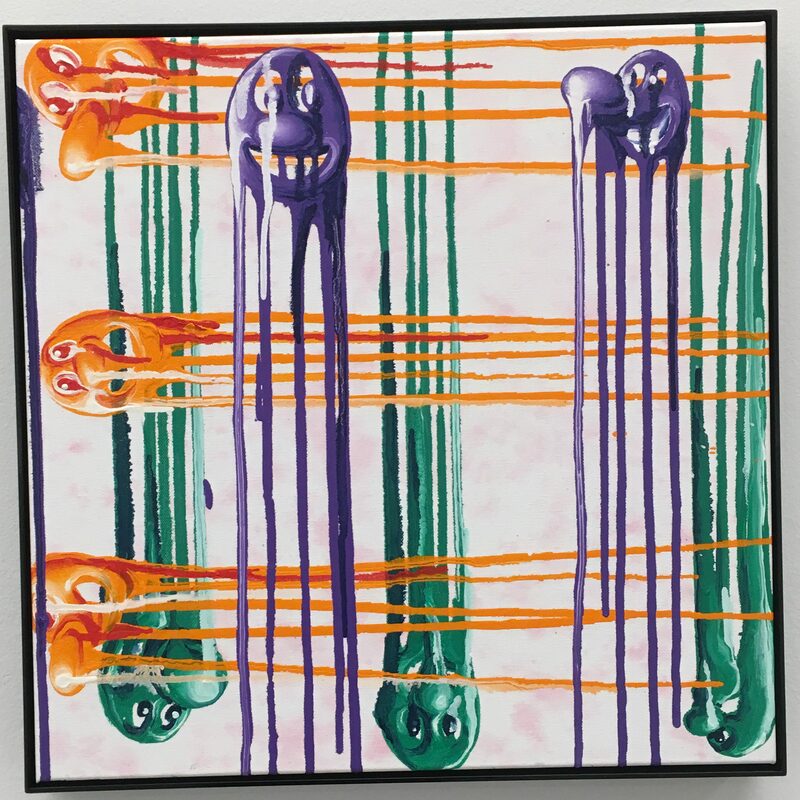 He makes use of cartoon faces to express emotion with abstract power. 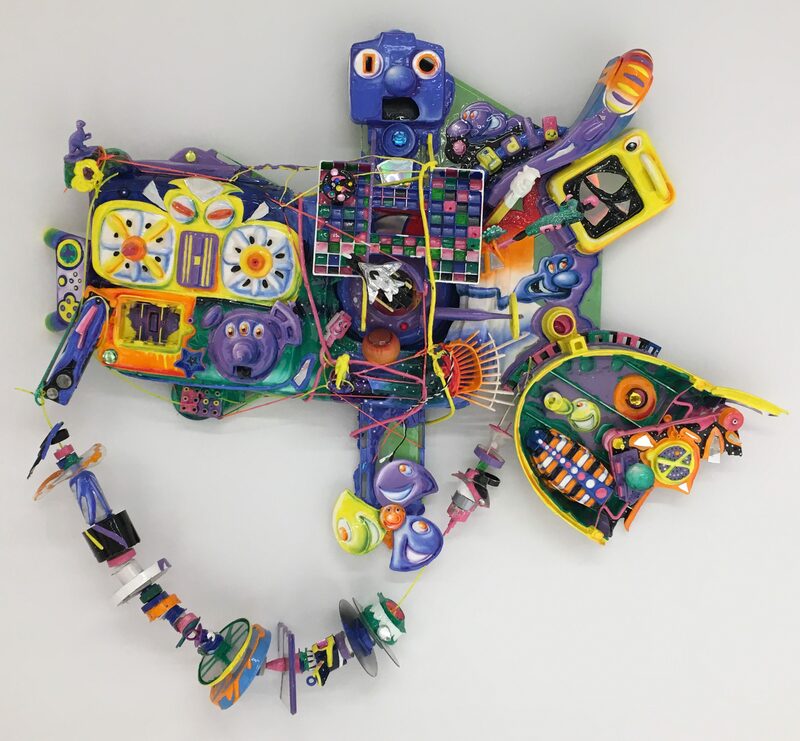 In the past, Kenny found many of the items integrated into his art in the garbage,and even today he still stops his car when he finds plastic toys and TV sets thrown away on the street. 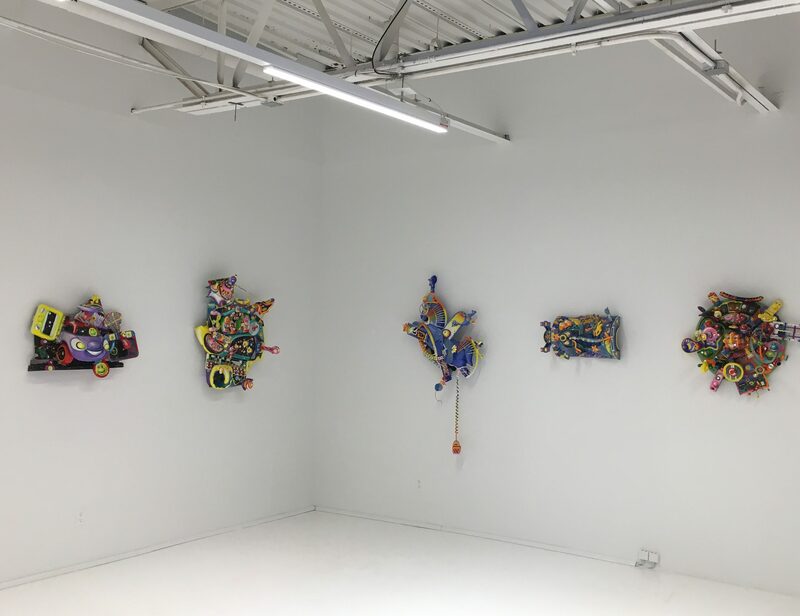 These discarded plastic objects have inspired the two other bodies of work featured in the show, one being TV Bax. 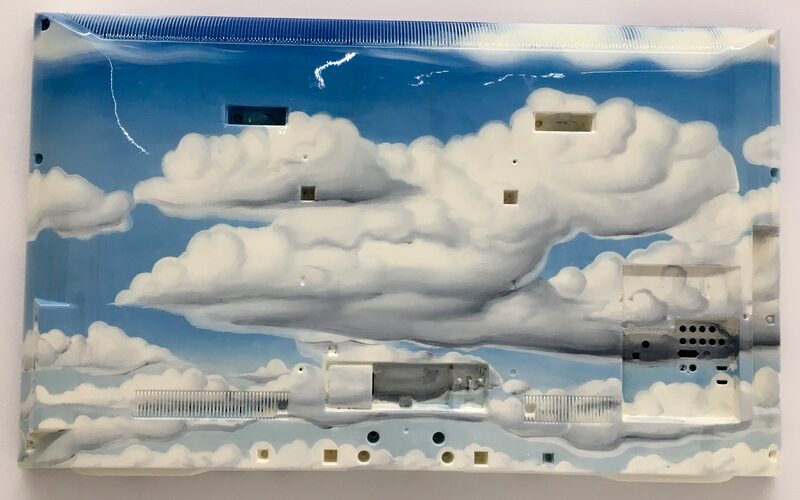 The TV Bax are painted on the plastic backs of discarded television sets. 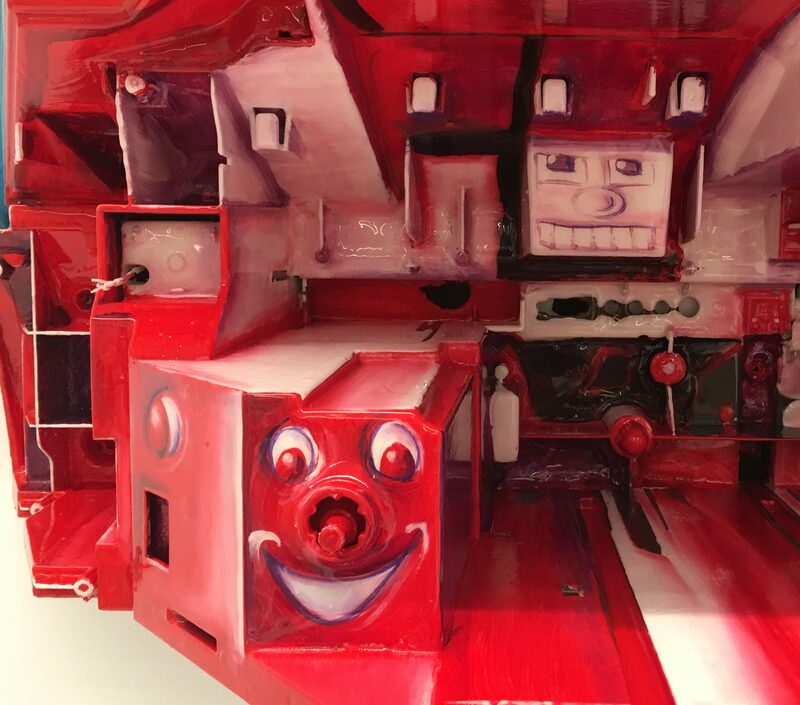 Like the toys, the TV backs have a disconcerting anthropomorphic quality. 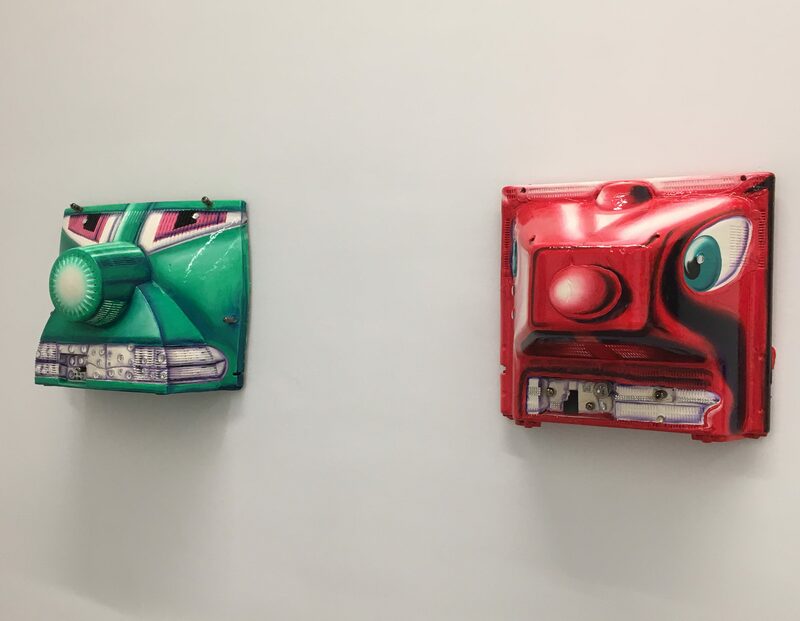 Scharf wonders if their anonymous designers created these plastic covers, which are different for every model, to resemble a face. 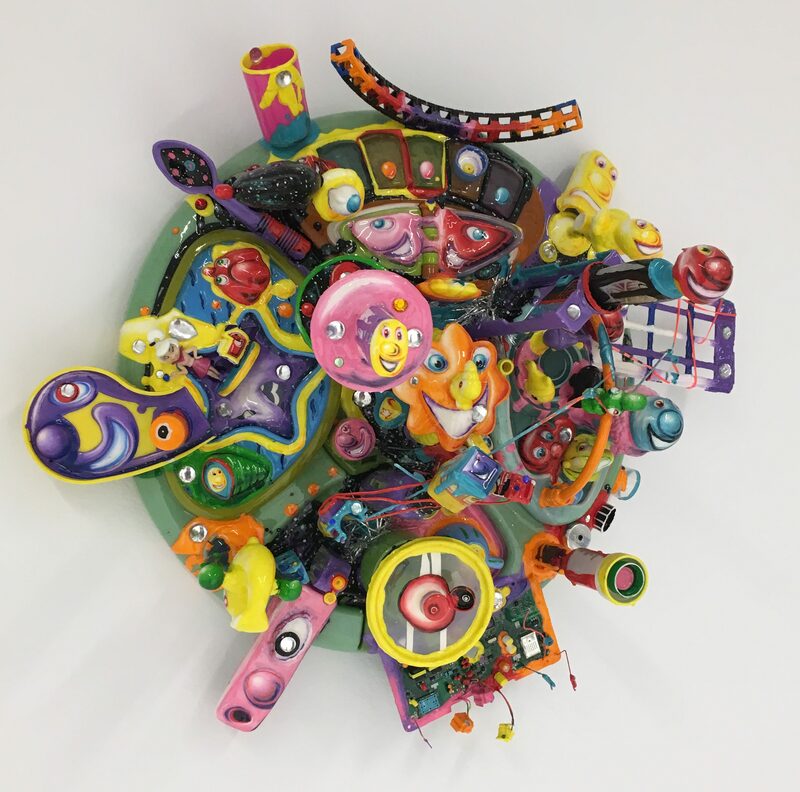 Scharf finds these thrown-away toys and TV backs to be poignant objects, resonant with emotion. 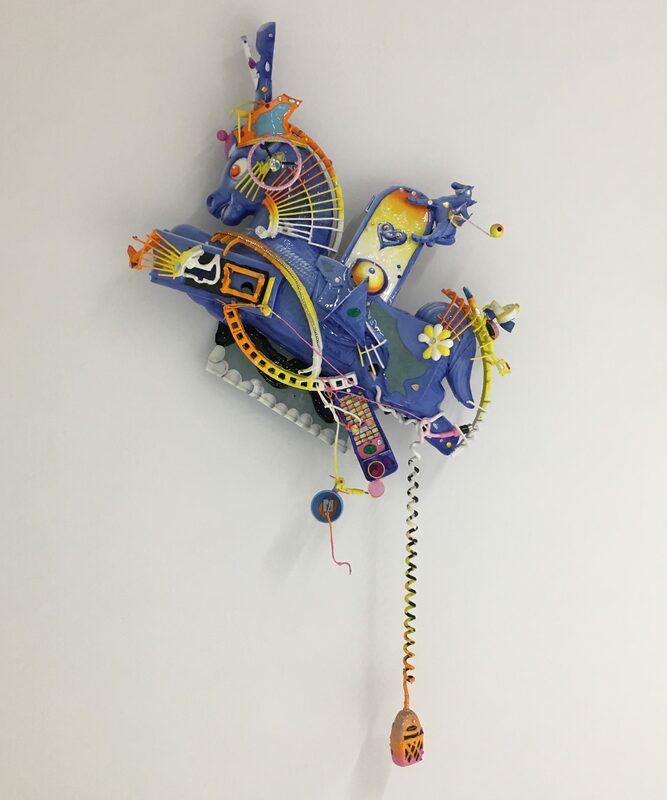 “Each of these objects carries a story,” Scharf explains. He thinks about how people might have struggled and sacrificed to buy these toys and TVs, and about the intense relationship that children and families have with them. 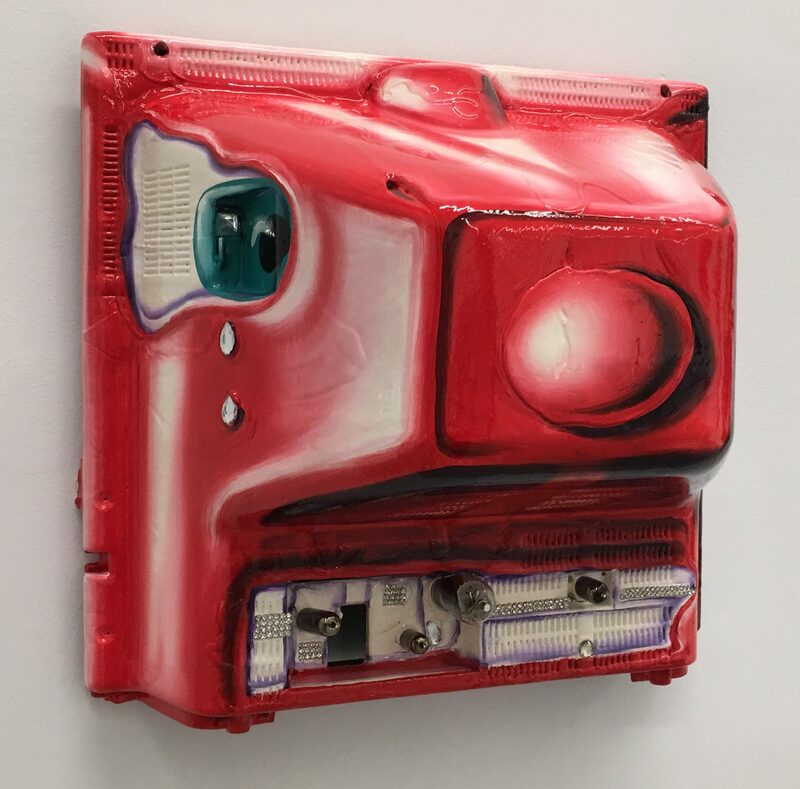 Scharf resurrects the lives of these inanimate objects in his work. He also notes that garbage keeps changing with technology. The backs of TV sets used to have large protruding “noses.” Now they are flatter and more similar to a canvas. 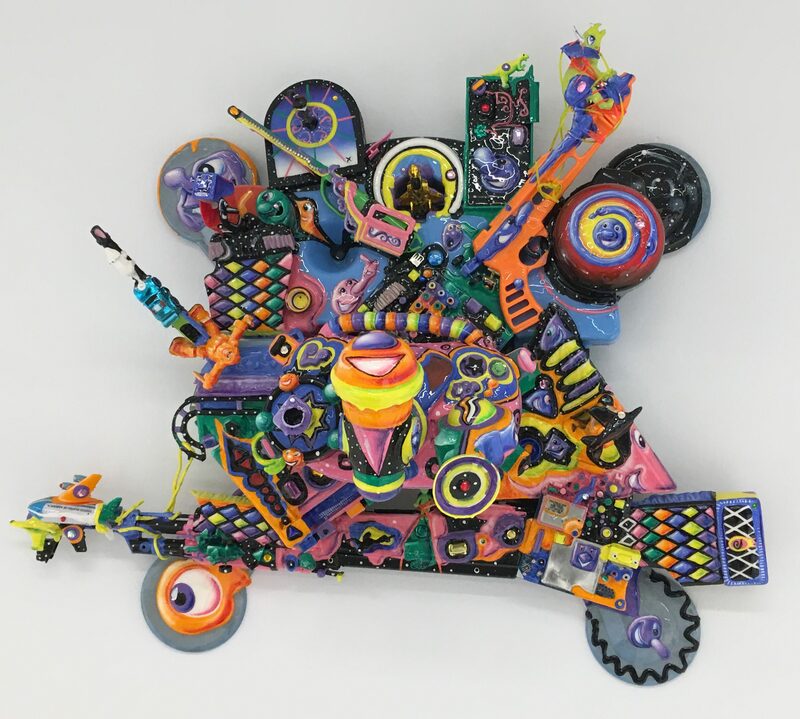 Another new collection, his Assemblage Vivant Tableaux Plastiques, inspired by the Nouveau Realistes, are constructed from his stock of recycled plastic toys. 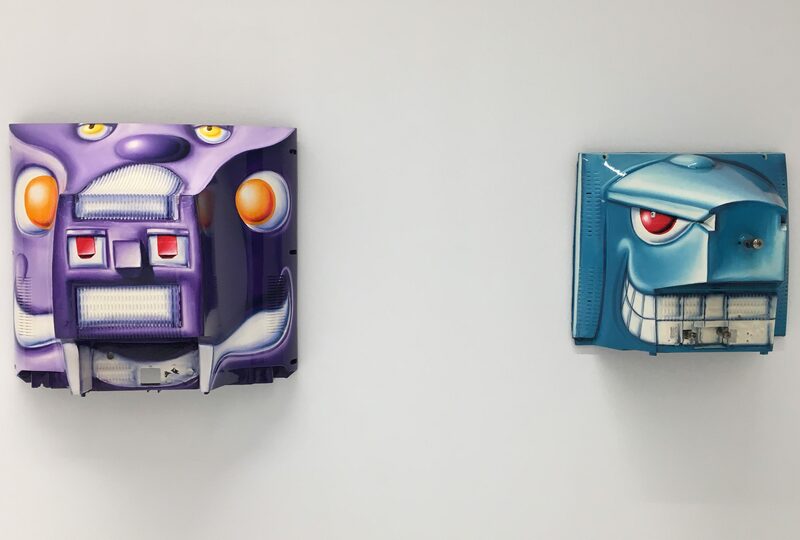 These wall sculptures, which mix assorted toy parts with Scharf’s whimsical animated faces, are my favorite items in the exhibit. 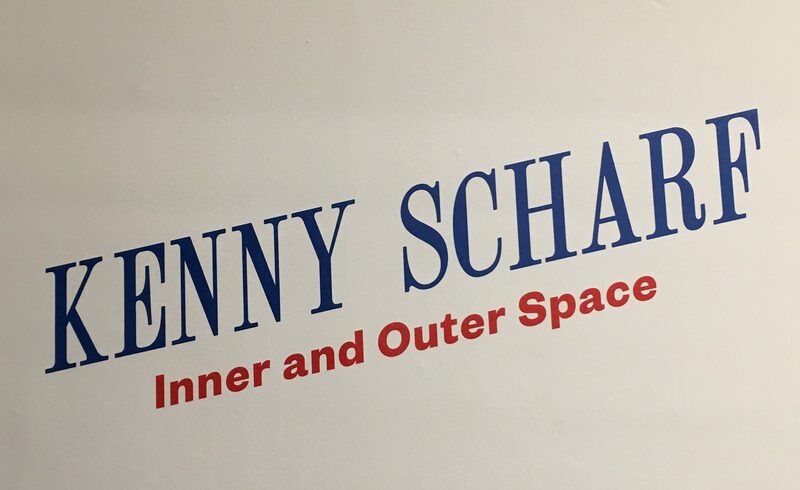 Since his childhood, Scharf has been fascinated by outer space. Space travel and the portrayal of infinite space have long been central themes. In his life and in his work, he tries to eliminate boundaries and borders. 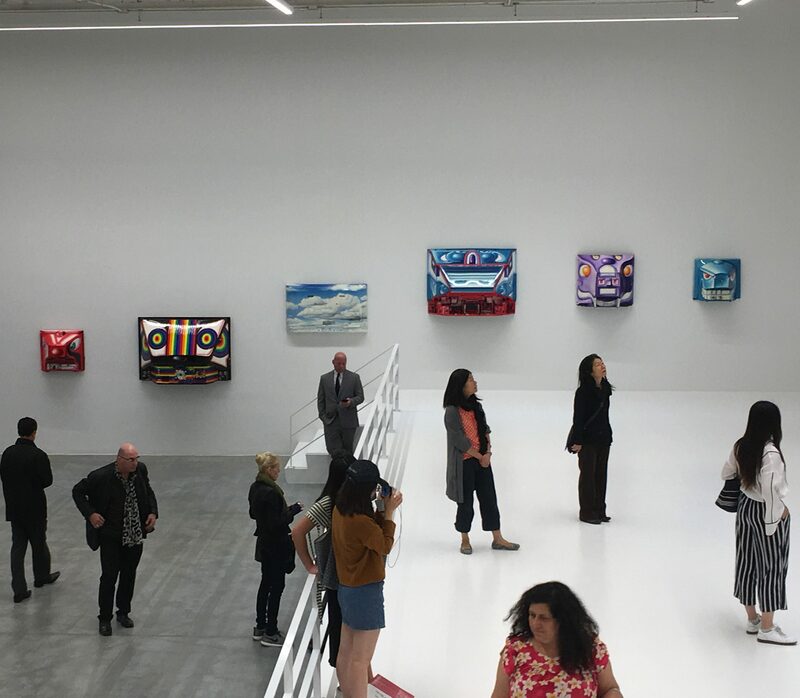 As he pursues his dialogue with the great painters of the New York School, he is increasingly preoccupied with the inner space of painting. His exploration of inner space creates a dynamic tension with his passion for outer space. 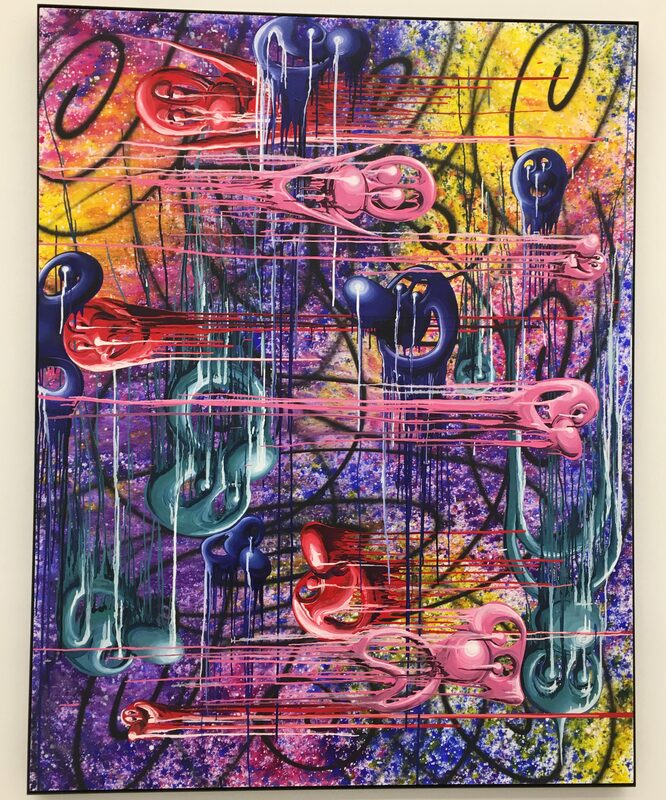 With his characteristic exuberance and his moral voice, Scharf reformulates his unique combination of Pollock and Pop to create a vibrant new body of work. 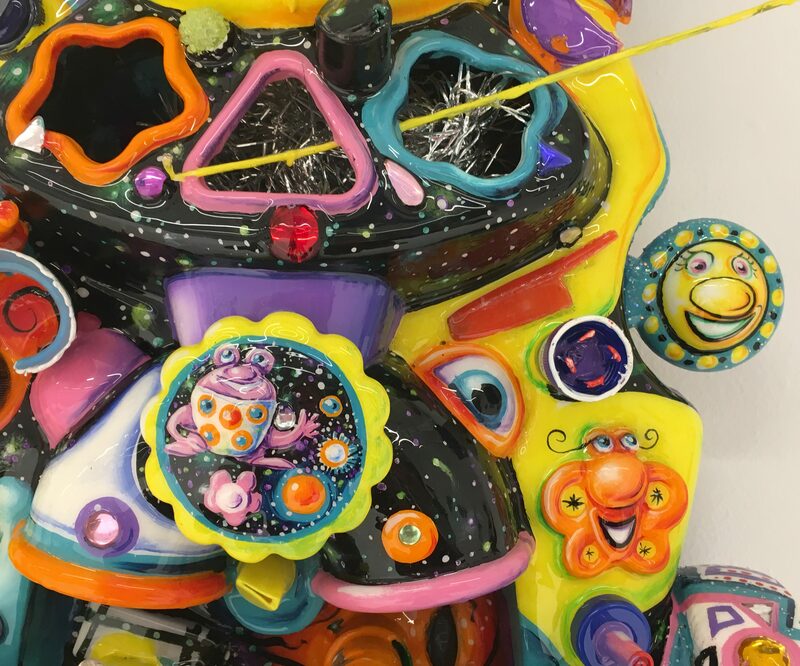 Kenny Scharf’s Inner and Outer Space will be on Exhibit Through December 22nd, 2017 at Deitch Projects, Located at 18 Wooster Street (Just North of Canal) in NYC. 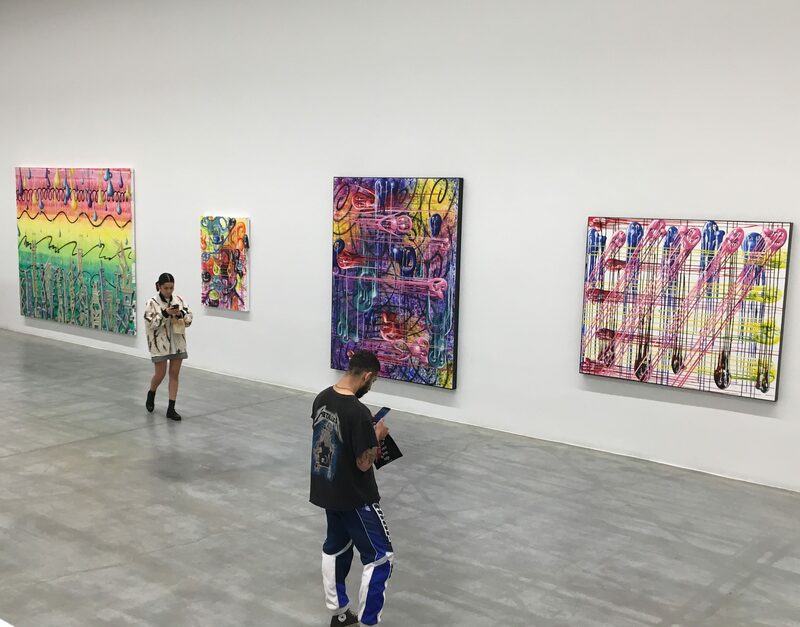 Kenny Scharf and Friend at the Exhibit’s Opening Reception.